Better Projects: What skills do business analysts need? What skills do business analysts need? I surveyed about 100 job postings for business analysts in Australia, the US and UK and came up with this spread of requirements posted. I have aggregated some things and where jobs asked for technical skills such as oracle, SAP, dot.net and so on I have listed it under "understanding the technical domain." All of these advertisements were under the title of "business analyst" and not systems analyst, analyst/programmer or anything else. I provide this graph for your information in case you are thinking of applying for a job as a business analyst. The resulst align with many writers on the topic of what is a business analyst - the focus is on communications, consulting and requirements management. It also highlights the common idea that a BA should have some sort of technical background, often that they have pogramming or DBA skills. Sampling what actual employers are looking for in their BA hires is a great way of finding the breakout of desired skills. I started trying to do a similar exercise, but was probably trying to do too much with it and got bogged down in the weeds of survey methodology and dropped it. Glad you put this out! This will also be an interesting topic to monitor over time to see if and how the mix shifts. Very little organised researh ethods were applied. I basically googled, mostered, seeked adn just marked things up in an excel sheet for an hour or so. Nice work Craig. That seems to be the pulse of the market, no doubt. 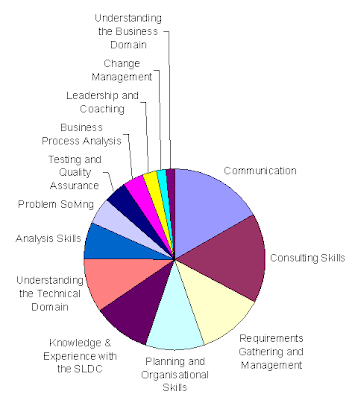 However, is this really a true spread of the skills a BA needs? It's not a question to you, it's a question to the industry. It bothers me to see that 'Understanding the Business Domain' is one of the thinnest slices of the diagram. I agree with you. I just read an article at CIO.com (Thanks Angie)talking abut tht issue exactly. Read it here. Gor example, in terms of "degrees as training" I think a Bachelor of Business is mch more suitable than an Bachelor of IT for this sort of job, even though IT degrees are the ones with requirements management in their curriculums. Now there's an idea; a bachelor of business with analysis and IT architecture as your optional subjects. Great visualization of what BAs do. Love it, thanks!